Lucretius (99-55 B.C.E. ), a Roman writer who lived in the first century before the common era, coined this oft repeated sentence. “Tantum religio potuit suadere malorum” or, “religion has persuaded us to so many evils”. Lucretius referred to religious wars and persecutions. We Jews are experts at being the target of such persecutions. Read the latest book by James Carroll, a Roman Catholic and ex-priest called Constantine’s Sword, and you will read a history of unending anti-Jewish hatred and its bloody results as it played out in Europe from the time the emperor Constantine established Christianity as the Roman state religion in the fourth century C.E. until our own day. Today, of course, Christians have made a considerable effort to bring about changes in that ancient hatred and to accept Jews as equals and partners. Even as this new attitude has developed in the West, the nearly 1 billion Muslims in this world preach the same canards against Jews that the medieval world heard every day in every church, in every school, in every family. Leading all in anti-Jewish atrocities, however, are the Palestinians and their friends, who use their media to promote an incessant barrage of religious hate such as has not been seen since “Yasser Arafat’s” uncle, Husseini, lived in Berlin with Hitler throughout the years of the second world war. The president of Syria publicly tells the Pope that Jews are “Christ Killers” even as the Egyptian Press publishes anti-Jewish cartoons reminiscent of Der Stürmer, the infamous Nazi paper, operated by Julius Streicher during all of the 12 years of the “Third Reich”. The third party to that triumvirate of anti-Jewish hate mongers is the Buffalo News. Here are three cartoons. One was by Der Stürmer, one was published by Al Arabi and one was published by The Buffalo News. The message is the same in all three cartoons. Hate the Jews. We need to review whether we want to buy from those who advertise in such hate sheets or subscribe to such bigotry. It is of course evident that the entire media establishment from The New York Times (which is not Jewish owned) to CNN skews the news deliberately so as to put Israel into a bad light every day. When Arabs bomb and kill Jews in the middle of Tel Aviv or Jerusalem, the media find no fault with such mass murder. 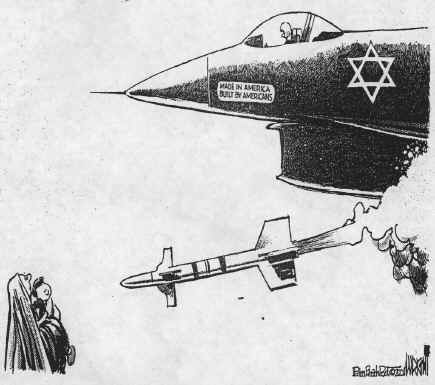 When the Israelis seek to defend themselves and strike at military installations the News and others pretend that American planes are used to kill innocent women and children. The media have therefore substituted anti-Israel slogans for the centuries old tales about "Christ Killers” and the “Blood Libel” which pretended that Jews bake Matzoth with the blood of Christian children. These accusations and the lie that Jews poison the wells have now given way to the idiocy that Jews who are born in Judea are somehow “settlers” wile Arabs born in Egypt, Saudi or even Europe or the United States are somehow “refugees” or “natives” in a non-existent “Palestine”, which is nothing more than an old Roman-Latin name for Israel derived from the word “Philistine”, a people long gone and mentioned in the Torah as the adversaries of Samson. There are no Philistines and there are not and never were Palestinians. The Arabs who live in Israel are immigrants and the children of immigrants seeking to take advantage of the labor and money and enormous sacrifice of the Jewish people in building the Jewish homeland after centuries of occupation by the British and the Turks. A Jew who lives in Judea and Samaria has the same right to live there as a Frenchman has a right to live in France, a German in Germany or an Arab in Arabia. The truth is that those who say Jews have no right to live in Judea are the same people who said no Jews had a right to live in Germany or in Poland or anywhere. Furthermore, if Jews have no right to live in that part of Israel called “The West Bank” of the Jordan, why do Arabs have a right to live in Haifa, Tel Aviv and even Yerushalayim? The media don’t answer that. The media call Arab mass murder an “uprising” and Jewish self defense “aggression”. The media never print or say that there are Arabs, not loyal to Israel, in the Israeli parliament or Knesset. Can anyone name one Jew in any Arab parliament? Of course the Arab countries are all dictatorships whose bosses are no more elected than Arafat was ever elected. Yet, the media pretend that this bloody liar is a “president”. The media label Jews who seek to live in their land and farm it and build it in Golan or in Gaza or in Hebron, “extremists”! Yet, an Arab who kills twenty young Israelis in the middle of Tel Aviv is a “freedom fighter”. Language is a weapon. Language makes a huge difference because all of us are subject to symbolic interaction. Symbols count. Pictures count. 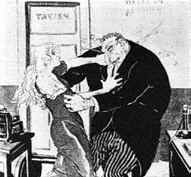 The Nazi bosses knew that and therefore instituted a full time propaganda machine under Joseph Göbbels to rant against Jews day and night. Now our media have become the mouthpiece for the Arab terrorists. Yet, we need not stand idly by and let this go on. This is not Poland. This is not Germany. This is not Russia. 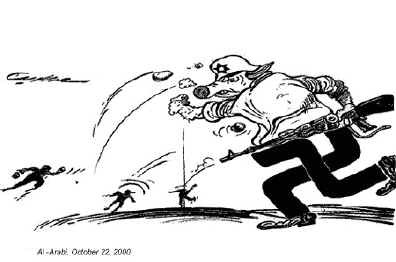 Here we can cancel our subscription to a newspaper that prints anti-Jewish cartoons. We don’t even have to buy from those who advertise in such newspapers. We do not have to vote for a president who invites the bloody terrorist into the White House again and again. We can vote for a president who will not invite the current Hitler to visit him here. We can even write and speak against these atrocities and be assured of the support of the vast majority of our Christian brethren who know a murderer when they see one. Speak up now. Write to the News and its anti-Jewish propagandists. Write to your Congressmen and women, denounce the murderers, visit Israel, send money, learn Hebrew, attend the synagogue of your choice and say to one and all “Onochi Yehoodi” - “I am a Jew”.